Charter rates local travel within 100 miles from garage and within 10 hours: $1100.00 per day. Rates to be determined by travel and destination. Rates over 100 miles from garage but within 10 hours, plus tolls, parking, driver, hotel, fuel, and any other related expenses. Rates away from home over 500 miles several days hours of driving need of one or more drivers, tolls, fuel, hotel, accommodations, parking, and or any other related expenses. 14, 15, and 25-passenger vehicles. Regular 14-passenger vans with driver for local and not exceeding 400 miles, round trip 10 hours from garage: $700.00 per day. With driver for local and not exceeding 400 miles round-trip, 10 hours from garage: $900.00 per day. With driver local and not exceeding 400 miles round-trip, 10 hours from garage: $1000.00. Any tolls hotels parking and related charges will be added as per destination. Designated driver's rates will increase as per demand and will not be guaranteed, unless booked no less than 60 days prior to the event to secure vehicle. Pre-arranged daily, weekly van service is based on time, distance, location, or at a rate of $90.00 per hour plus tolls and any other related cost. Children fares are age 0 to the age of 10 years. Small children must be accompanied with a child seat as required by law. No excuses. You will not board our buses without a car seat for your child. Safety of your child is utmost important. Fares are based on a one day visitation. If you wish to stay overnight, then the fare will be doubled to accommodate your return trip. There is no refund on these discounted fares. Pending the situation resulting you may not complete your trip, a credit fare will be allowed as follows. Breakdown: you did not do your trip, act of God, bad weather, police activity, roads are closed. Minimum visits will be two hours. Medical conditions; please inform us when making reservations of any medical conditions. You may be suffering i.e. heart conditions, breathing problems, allowing us to seat you for easy access if needed by a medical team. Fares are now paid in cash at the bus or preferably using your credit or debit card so as to validate and maintain a record of the transaction. Website is now active 24/7, allowing you to do a reservation at your leisure. Office hours: Monday to Friday, 8:00 AM to 5:00 PM. Please maintain a clean environment while riding on the bus. Do not throw your garbage on the floor between seats, gum sticking on seat backs. Food will not be allowed only as approved for small children and persons who need to eat at certain times to maintain their blood sugar levels. Smoking or the use of alcohol or drugs will not be allowed. Should there be a breakdown or any other issue, please follow the drivers and or police instructions. Your safety will be in your hands if you don’t follow instructions. 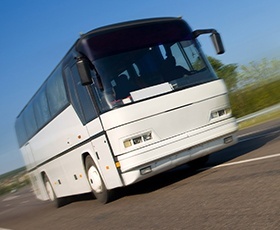 Drivers are not to be interrupted while operating a motor coach. If you do, you can be arrested and face up to 25 years in jail for misconduct under the terrorist act. Safety is very important. Do not violate this. Bronx: 161st Street River Ave, in front of Apple Bank or as directed Yankee game time. 161st Street and the Grand Concourse, in front of the supreme courts at 10:00 PM. After 10:00 PM, back to Apple Bank. For 1:30 AM pickups, SHU visit during the day on Saturdays, 161st Gerard Ave, in front of Crown Donut Restaurant. 11:30 AM, Mid-state and Cayuga. 161st River Ave or 161st Grand Concourse. April to October. Game Time 10:00 M Saturday and Sunday. 161ST RIVER. ALL TIMES, 1:30 AM. Saturday and Sunday. Sutphin Blvd. and Jamaica Ave. Dunkin Donuts. 12:45 AM. Saturday and Sunday mornings. SHU: Saturday morning at 10:30 AM. Flatbush Ave and Fulton Street. McDonald’s. Saturday and Sunday mornings at 1:00 AM. SHU visit Saturday morning at 10:30 AM. 8th Ave between 34th and 35th Street. 10:30 PM. Fridays and Saturdays. SHU Saturday morning at 6:30 AM and 7: 00 AM. 116th third Ave Saturday and Sunday mornings 1:45 AM. In front of the Albany bus station, 34 Hamilton Street Albany. 2:00 AM. Saturday and Sunday Mornings. 5:00 AM. Saturday and Sundays 2:00 PM. Saturday only SHU. access all trains 34th Street Penn Station to uptown down town cross town shop on 14th Street the Village China Town 42nd Street or go uptown to the shopping Malls and out lets, visit all the museums Radio City Fifth Ave Piers Boat rides Statue of Liberty World Trade Center 9/11 Memorial so much more have a blast . Thursday nights return Monday Mornings. 8th Ave 34th Street arrival 8.30 am..
Fares depending on season Adults will range $35.00 to $65.00 subject to change at anytime. Child zero to 5 years $40.00 and child over 5 years will pay Adult Fares.